It is essential to conserve the Dambulla Rajamaha Viharaya also known as the Cave Temple Complex if the historic site is to retain its world heritage status, Prime Minister Ranil Wickremesinghe told a group of young Buddhist monks who met him at Temple Trees today. “The Government is prepared to stop the conservation work if the Maha Naya Theras want it stopped. However, it is up to the Maha Nayakas to decide the fate of this historical site. It is unfortunate if the Cave Temple Complex is to lose this status at a time UNESCO is considering the declaration of several other Sri Lankan sites including Horton Plains as world heritage sites,” he said and added that he would meet the Asgiriya Maha Nayake Thera next week to explain these matters to him. The Premier said some people were trying to politicize this issue targeting the next election and accused the media of giving prominence to stories such as this when there were a host of other important issues to talk about. 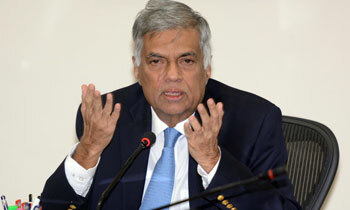 even Mr ranil tries to do some good thing people dont believe him. this is not good for our counry s development.